Desde él se divisa una magnífica vista de las Catedrales. Insensible al paso de los siglos, este robusto puente surca el río Tormes. Tiene quince arcos reconstruido en el S. XVII, dañado por las crecidas del río. Forma parte de la Calzada romana de la Plata, que unía Mérida con Astorga. 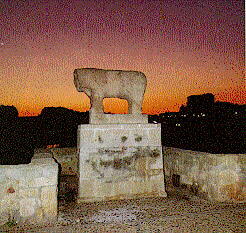 Junto al puente se aprecia la figura de un verraco ibérico (cerdo semental) ver fotografía, representante del arte prerromano salmantino, de origen celta (prehistórico) y que está incluido sobre el escudo de la ciudad. From here, there is an excellent view of the Cathedrals. 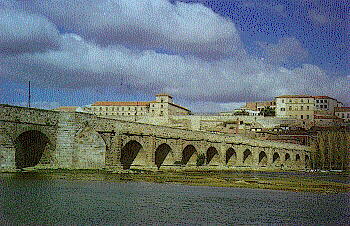 Unaltered by the passing of time, this strong bridge stand above the Tormes River. It has 15 arches reconstructed in the 17th cent. 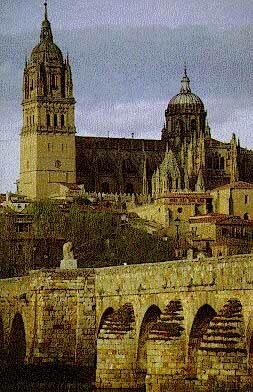 due to the damages caused by the river floodings; it was part of the Roman road that connected Merida with Astorga. Next to the bridge there is an Iberian verraco (male pig) that is seen in this picture, representing the pre-Roman Salmantine art, of Celtic origin and that is portrayed over the shield of the city. There exists a newer bridge, constructed at the beginning of our century, in honor of the one constructed 19 centuries ago, on which a poster announced: "Attention, Trucks over 18 tons use the Roman Bridge."